I grew up with a Puerto Rican mom who firmly believed that all meat should be marinated before cooking. At least for a few hours, preferably overnight, and sometimes even longer. It produced dishes that were always richly flavorful with juicy, well-seasoned meat. This went for everything from simple chicken breasts to more elaborate large cuts like pork shoulder. Even delicate cuts of fish or shrimp spent a few minutes soaking in something delicious. When I grew up and moved out, I realized that not everyone cooked this way. 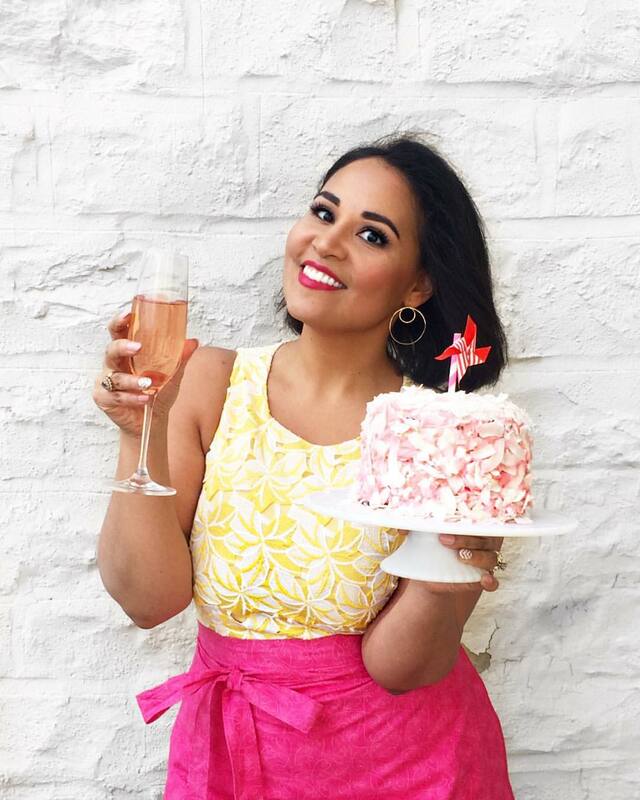 I spotted recipes that featured meat simply seasoned with salt and pepper before hitting the fire, and could not understand that style of cooking. Though I’ve since accepted that some things do work best simply dressed (a great steak, for example), I will always prefer dishes that have spent some time with a great marinade. This goes for my roast chicken, too! 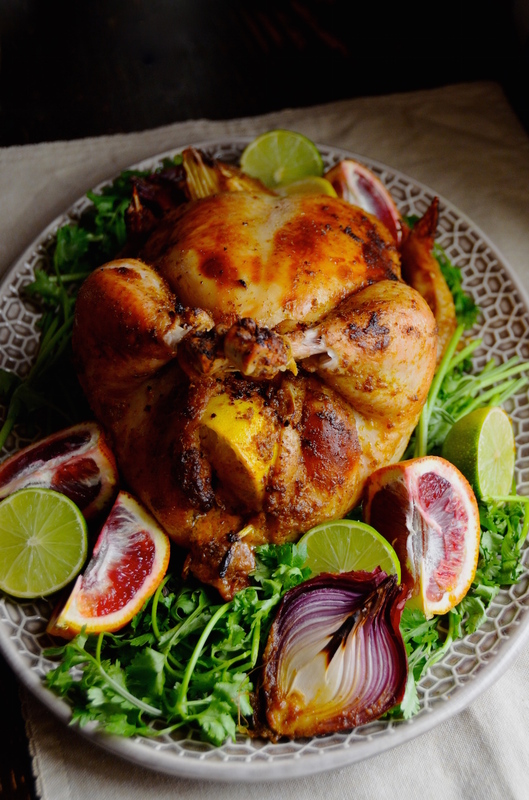 The Puerto Rican-style roast chicken is marinated before cooking in a simple blend of spices, garlic, and citrus. 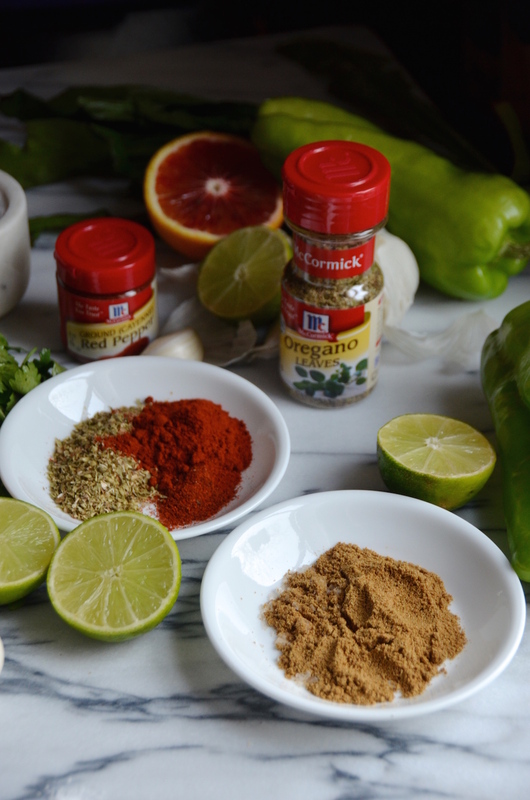 I recently teamed up with McCormick spices to show how you can easily add bright Latin flavors to easy traditional recipes (like roast chicken!). 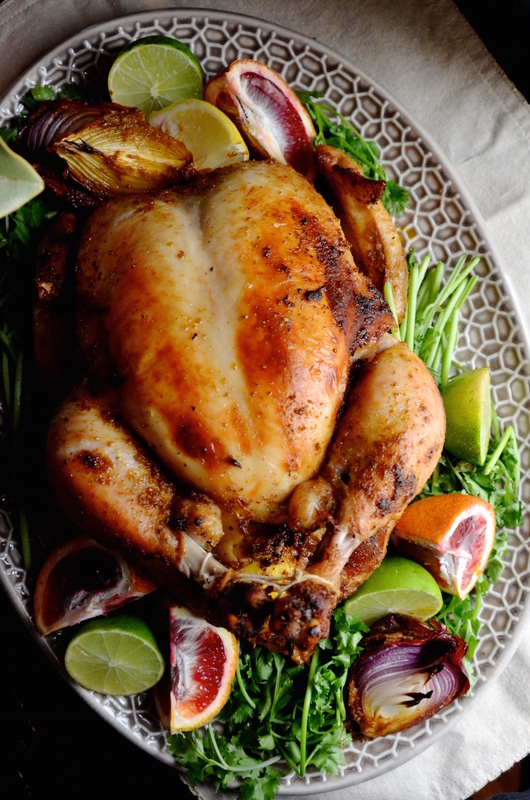 Just a few extra and easy-to-find ingredients that take a classic roast chicken recipe from good to incredible. To make this chicken, you start off with a spice blend of dried cumin, smoked Spanish paprika (my most favorite spice EVER), ground cayenne (for a bit of heat), and dried oregano. This is pureed along with salt (of course), a lot of garlic, pepper, cilantro olive oil, and citrus juice. Traditional Puerto Rican marinades call for sour oranges (or Seville oranges), which can be hard to find outside of neighborhoods with big Puerto Rican or Cuban populations. To mimic the flavor, I recommend a mix of regular oranges and lime juice, which will give you that perfect blend of sweet and sour. The chicken is then fully coated in this marinade inside and out, and placed uncovered in a baking dish. Stuff the cavity with another halved orange and any other bits and pieces you have leftover from the marinade—extra garlic cloves, cilantro, maybe a piece of leftover onion or carrot from another recipe…it all works! Place this in the bottom shelf of your refrigerator and let marinate at least 4 hours, but preferably overnight. The chicken is left uncovered, because this helps some of the extra liquid evaporate from the skin. 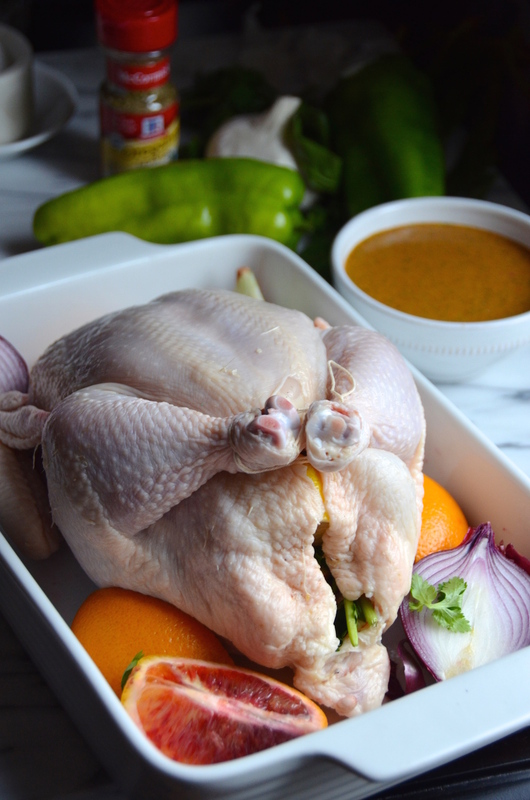 When you roast it, this is what will assure that you get a super crispy skin on the outside, with a juicy flavorful chicken inside. Another tip I’ll suggest is that you take the chicken out of the refrigerator at least half an hour before roasting. This will take some of the chill off the meat, and help it cook evenly. I love this chicken served with a side of simply roasted vegetables or even just a big and brightly dressed salad. Remember to save the leftover carcass, too. It makes an amazing Latin-flavored soup (though that’s a recipe for another day!). I used McCormick spices for the recipe below. The four I used can all be found in your favorite well-stocked supermarket! 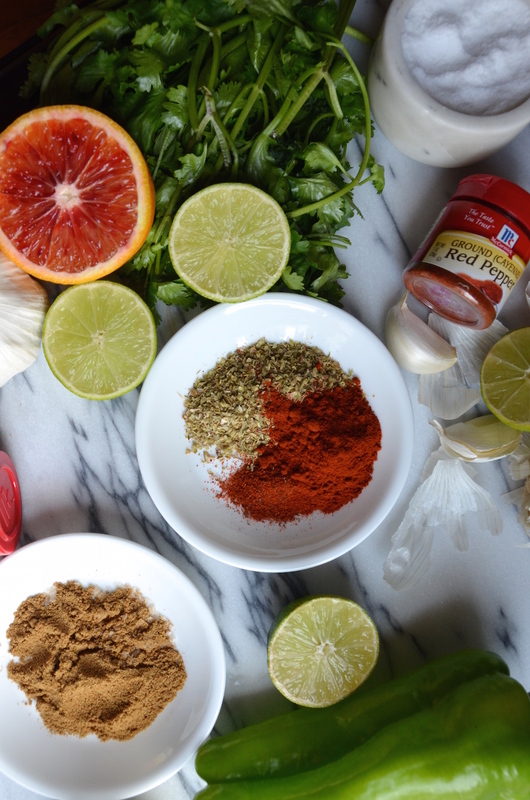 Start by preparing the sofrito marinade: In a blender or food processor, combine spices, salt, garlic, chopped pepper, cilantro, olive oil, orange juice and lime juice. Puree until smooth. Place the chicken breast-side-up in a baking dish or roasting pan, and cover with the marinade, pouring it over and inside the chicken. Use your hands to massage it thoroughly into the chicken, getting some between the skin and the breast. Place the uncovered pan in the refrigerator to marinate (I recommend using the bottom shelf to avoid any spills) for at least 4 hours, but preferably overnight. When ready to roast. Remove chicken from fridge and let stand at room temperature for 30 minutes. Preheat oven to 400 degrees. Place chicken in oven and roast for about 1 hour and 15 minutes, or until skin is crisp and a knife inserted in the thickest part of the thigh produces only clear juices.